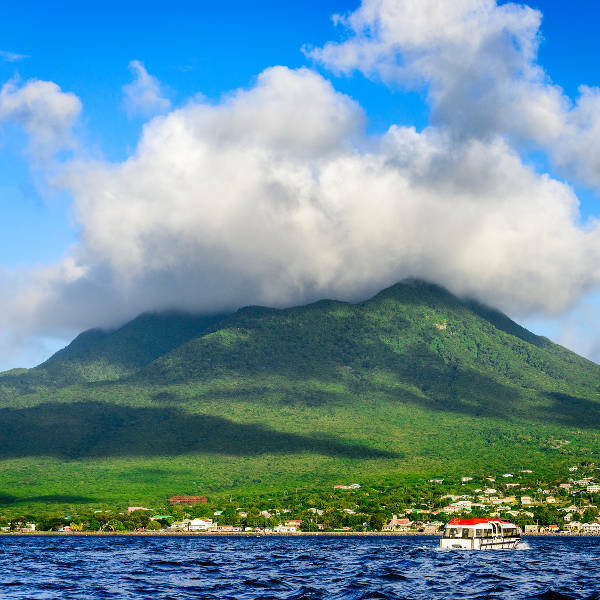 Nestled in the Leeward Island chain, lies the two-island country of St. Kitts and Nevis. Home to the first British and French colonies in the Caribbean, the islands inhabit a fusion of European architecture and calypso beats. Populated by 55,000 people, this country draws tourists to its idyllic beaches and landscapes. Popular attractions include Cockleshell Bay and Mount Liamuiga. Get ready for an exciting island-hopping adventure because cheap flights to St. Kitts and Nevis are now available! This Caribbean nation is served by Robert L. Bradshaw International Airport (SKB), a 10-minute drive from the capital city, Basseterre. With sugar-sand beaches wrapped around the islands, the palm-fringed coastlines of St. Kitts and Nevis exude leisure and relaxation. Grab a book and sunbathe under the coconut trees or set sail for a day of thrilling adventure on the water. 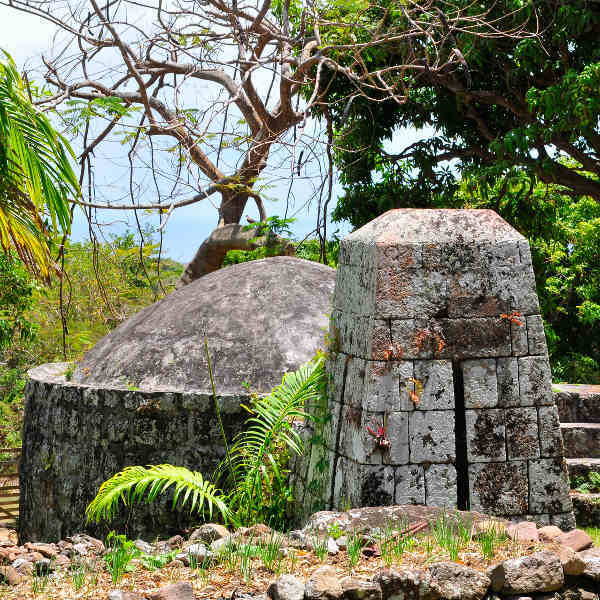 With the French and English once competing for territory over the islands, the country’s heritage is embedded in its architecture, cuisine and colonial ruins. Points of interest include Fort Charles, the National Museum and Brimstone Hill Fortress. Incredible hiking and scuba diving await the adventurous traveller. Guided trekking up Mt. Liamuiga offers unrivalled views of the Caribbean Sea, while water sports abound off the beaches of Cockleshell Bay and Pinney’s Beach. The islands’ high season occurs between December and April. Be prepared for soaring hotel rates and flocks of visitors. Be sure to book accommodation at least four months in advance to guarantee availability, especially during winter Carnival, in February. The sweet spot to visit is in May and June, just before the summer rains bring sweeping hurricanes. You’ll find cheaper hotel rates and the St. Kitts Music Festival to enjoy! If you’re set on visiting during off-season, July to November brings the lowest travel and accommodation rates, together with swirling hurricanes and heavy showers. Stay abreast of weather reports and be aware that many hotels close during this season. Boasting picture-perfect surroundings, palm-fronded beaches, intriguing architecture, and activities to enrich your body and mind, the two-island nation of St. Kitts and Nevis is a wonderful holiday retreat. Pulsing to the local Caribbean beats, the islands’ culture is infused with historical ruins, hand-woven silks, delectable cuisine and punchy rum cocktails. St. Kitts is the larger of the two islands and its colourful culture stems from its African slave history and colonial roots. Its Anglo-Saxon influences are portrayed in the Victorian and Georgian-style buildings peppered downtown in the capital, Basseterre. Wander around the city sights of Independence Square, Old Treasury Building and St. George’s Anglican Church. Sports fans can catch a cricket game at Warner Park. Wander through the ruins of Brimstone Hill Fortress – an iconic UNESCO national park, while the Scenic Railway transports you through old colonial ruins and sugar plantations. The oldest British settlement, Old Road Town, paints a historic picture of the rustic Caribbean. For panoramic views of the landscapes, do a day trek through the misty rainforests, up to the colossal crater of Mount Liamuiga, the country’s highest peak, overlooking the Black Rocks tumbling down to the turquoise sea. Nature lovers should hike off the beaten track, along the Wingfield-Phillips Rain Forest Nature Trail to explore the wild woodlands and delve into valleys of volcanic rock scattered with swinging vervet monkeys. Golf lovers can tee off at the prestigious Royal St. Kitts Golf Club, while party animals can dance to sultry reggae rhythms in the beach bars in Frigate Bay. 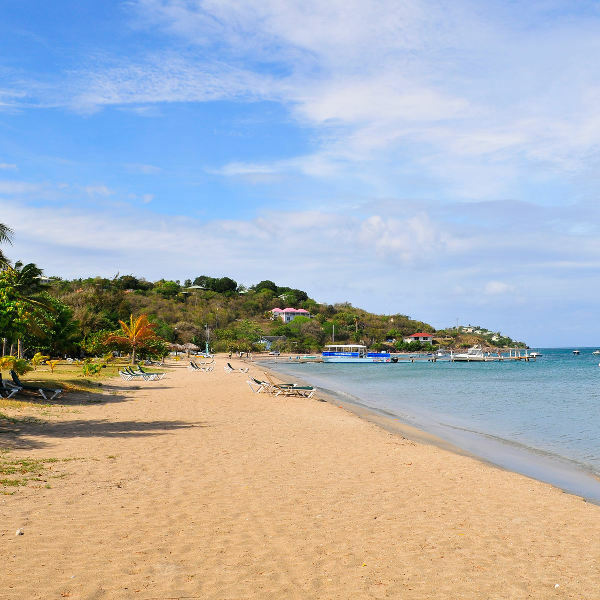 Soak up the Caribbean sun or make waves on a jet-ski off Oualie Beach and Pinney’s Beach, along the Nevis coastline. Divers can explore shipwrecks, caves and exotic marine life along Friars Bay Reef and Nags Head. Compare several airlines, and book your cheap flights to St. Kitts and Nevis online at Travelstart! The islands of St. Kitts and Nevis are generally trouble-free, but always exercise vigilance with personal belongings. Be careful on the roads at night, as roaming animals and potholes can suddenly appear out of nowhere. Avoid going hiking or walking along deserted beaches on your own – make sure someone knows where you are. Hurricane season runs between June and November, so heed the weather warnings and take cover when necessary. Tap water is fine to drink, but bottled water is cheaply available throughout the islands. Healthcare is fairly expensive and not as sophisticated as most developed countries. Also, most clinics and hospitals require payment upfront, which you can claim back afterwards from your insurance. There are no mandatory vaccinations required, but vaccinations against typhoid and hepatitis A are recommended. If travelling from a yellow fever endemic region, proof of immunisation for yellow fever is required. Outbreaks of the Zika and chikungunya viruses have been reported on St. Kitts and Nevis, so take the necessary precautions, including a strong insect repellent.